Settle down, class. Let's begin. If you’ve been in the market for home speakers, you’ve probably seen one brand name come up over and over again: Sonos. It’s to the point where the Sonos brand is almost a name for the entire product category itself, like how the iPod was for MP3 players. But what is Sonos and why are their speakers so popular? We’ll get into all of that as well as a few of the pros and cons of getting a Sonos speaker. Sonos speakers are on the shelves of electronic stores and even in Jay-Z songs, but what are they? First and foremost, let’s answer a basic question. What is Sonos? Sonos is an audio company that’s been around since 2002 and they were one of the first companies to use the internet in your house to connect speakers together. While we call it an audio company Sonos really only specializes in home audio speakers, so don’t expect to buy a pair of headphones from them anytime soon. Whether you’re looking to build yourself a fancy new entertainment room or want a single smart speaker for your apartment, they have you covered. There are a few key elements of Sonos speakers that make them the go-to for home audio, one of which is the ecosystem. Sonos sells a number of speakers ranging from small speakers you can put in the bedroom to bases you can place under your TV, and they all work seamlessly together. Plenty of audio products are a one-off, standalone product. If you buy a pair of headphones, that’s the end of the transaction. The same is true with Bluetooth speakers. But that isn’t the case with Sonos speakers. Buying one speaker just gets your foot in the door of their speaker ecosystem. The more speakers you get, the more options you have in terms of how you listen. You can mix and match them throughout the house and you get full control of everything via their app. Whether you want to play the same song across the house, this song in that room, or different songs in different rooms, the Sonos app lets you do that. Plus, combining certain speakers can get you a full 5.1 surround sound system. Sonos products aren’t cheap, and the company wants you to continue building your ecosystem by buying more and more of their speakers. This isn’t possible if their products are outdated after a year or two. So Sonos makes it a point to make sure that their older speakers are kept up to date via software updates for way longer than you might expect. The Sonos Sub and Sonos Playbar which came out in 2012 and 2013, respectively, are still an integral part of their product line-up to this day. So if you bought one of these all those years ago, it’s mostly likely still doing just fine in your living room (or wherever you set it up). Setting up a speaker is as easy as opening the app and following the on-screen instructions. As we mentioned before, Sonos speaker connect to each other wirelessly via your home internet, but what exactly does that mean? During setup Sonos basically makes its own mesh network, which basically means the speakers are able to directly send information between each other without interference from any of the other electronics on your router. That said, if you happen to have a lot of things connected to your Wi-Fi then Sonos also sells the Boost which, as its name implies, acts as a Wi-Fi extender to give a little boost to the Sonos mesh network. What are the pros and cons of having a Sonos system? 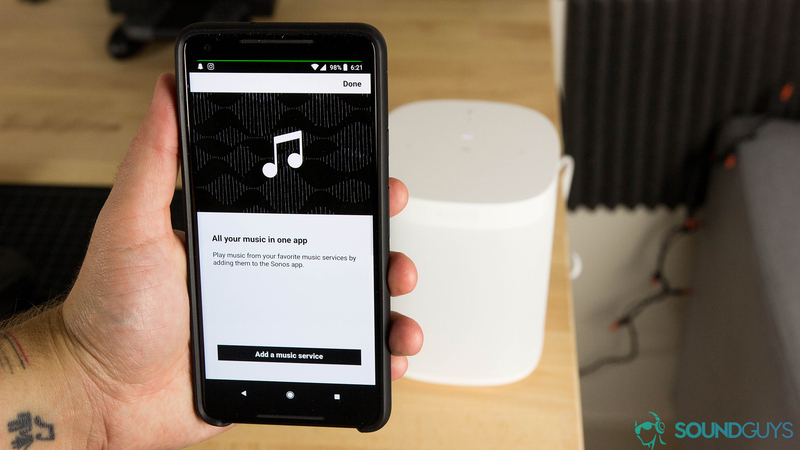 We’ve already mentioned some of the better features that have helped make Sonos a go-to for home audio, but let’s get into the nitty-gritty now. What are some of the pros and cons of buying into this ecosystem versus just building a home audio setup yourself? First, setting up a Sonos speaker is super easy. All you need is an internet connection, and of course an electrical outlet. If you don’t want to deal with a bunch of cables and connections then these are for you. As soon you plug in the device all you have to do is open up the Sonos app which is free on both iOS and on Android. From there, just follow the steps to connect the speaker to your home internet and to the rest of your Sonos speakers if you have any. Using your iOS device, you can calibrate the speakers to the room with the app. This is where things split depending on if you have an iOS device or an Android device, because on iOS the setup can be taken even further with something called Trueplay. Trueplay calibrates the speakers to their location with a series of tones and beeps. The speakers can correct itself to try and get the best sound in that particular area of your house. While it’s true that this is something that both the Apple Homepod and the Google Home Max can do this on the fly without any special beeps, you’ll still have to set aside a few minutes during setup to get the best sound out of your Sonos. The company does plan to eventually have it work automatically like the Homepod and Home Max, but until then the Trueplay dance is a right of passage to anyone who really wants to get the most out of the speakers. Think of Sonos like Switzerland. Whether you’re talking about the streaming wars between the likes of Spotify and Apple Music, or the assistant wars between Siri, Alexa, and the Google Assistant, it doesn’t matter. Sonos plans to work with them all. If you’re subscribed to some random music streaming service that we didn’t even mention in our list, don’t worry. Here’s a full list of everything they’re compatible with. Touch controls on top of the Sonos One let you control your music if voice isn’t supported. The company is taking a similar stance when it comes to voice assistants. Rather than choosing sides, they’re just going to play nice with everyone. Something like the Sonos One already has compatibility with Amazon Alexa, and the company wants to also work with Siri and the Google Assistant in the future. Though it’s worth mentioning that at the time of this post, full compatibility with the Google Assistant has been pushed back to some time in 2019. At the risk of being a cliche, Sonos has different forms for different functions. If you want a soundbar for your TV, they have that. If you want a subwoofer to pair with your soundbar, yeah, they have that too. They have a dedicated speaker for every aspect of 5.1 surround sound, as well as a few others that you can spread out as needed. Not to mention that they’re designed to be discreet and out of the way, so they don’t become the focus of your living room. Returning to a previous example, the all-black Playbar from 2013 still won’t look out of place today when paired up with their newer offerings. Because they’re designed to be a piece of the whole, no one speaker outshines the rest. If you stopped reading now, you might leave with the impression that Sonos speakers are the best damn things since sliced bread. And while the pros do outweigh the cons for most people, there are still plenty of cons. The connection options on the back of the Sonos Playbase. This is a problem for all WiFi speakers, so it isn’t a problem that’s exclusive to Sonos speakers. Still, it’s worth noting that if you have a shoddy internet connection or if there’s an internet outage, your speakers are just pretty paperweights. No products in the lineup have Bluetooth compatibility. It’s WiFi or nothing. Now there are some clever workarounds that let you bypass this and stream over Bluetooth, but they require you have a Sonos speaker with a 3.5mm input, a cheap Bluetooth dongle from Amazon, and a youthful lightheartedness that allows you to laugh at the absurdity of spendings hundreds of dollars on a lifehack. While this isn’t really a big deal, it’s kind of a big deal. Sonos doesn’t support Dolby Atmos. It does, however, support Dolby Digital 5.1 for surround sound which is basically the standard right now for surround sound. Dolby Digital 5.1 is what you might picture when you think of surround system. It utilizes six different channels: two surround speakers, a left and right speaker in front, a center channel, and a subwoofer. Make sure to place your soundbar below and in front of the T.V. If your configuration uses upward firing hardware elements, clear the sound’s path from the drivers to the ceiling. Dolby Atmos works a little differently. It creates a 3D envelope of sound around your head providing for a fully immersive experience with true to life- yeah, enough of that marketing nonsense. Basically, Dolby Atmos allows for upward firing speakers to bounce sound off your ceiling. To be fair as boring as that sounds, the spatial effect it has when watching movies is actually really cool and is something that other soundbars like the LG SK10Y do support. Most people won’t mind and will be more than happy with a great 5.1 surround sound setup, but home audio nerds will definitely take notice. That brings us to the third point, which is that there are better sounding setups you can get if you’re willing to spend more time and money. That’s saying a lot because Sonos speakers aren’t exactly cheap to begin with their entry-level Play:1 speaker starting at $149 per speaker. It’s the ease of use and compatibility between speakers that lures so many to Sonos products (oh, and of course that infamous Jay-Z line). If you don’t want to do too much research and just want to plug-and-play then Sonos is great for that, but you shouldn’t leave this article thinking they’re the best speakers ever made. Not to mention that Sonos doesn’t like to rush things. The company takes its sweet time and while the product release schedule has definitely picked up the pace in the last year or two, you shouldn’t buy into Sonos expecting to be wowed every few months with a new speaker or accessory to add to your setup. The Sonos ecosystem isn’t for home audio nerds, it’s for everyone.